Free Christmas songs (four versions) Deck the Halls -- give your students this well-known, beloved Christmas carol! an easy version in Middle C position. The complete Christmas song lyrics are included also, at the bottom of this page. 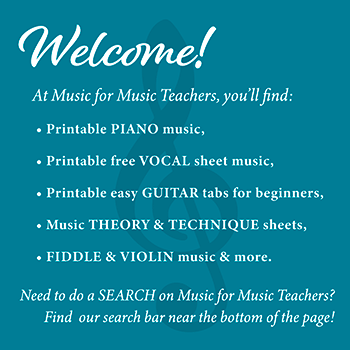 As I have done with many beginner songs, I have doubled the note values so there are no tricky eighth notes for beginner piano students in two of the arrangements. Beginners will start off playing it slowly, but the counting won't be a problem, and they will pick up speed. Below is a lively arrangement which makes use of left hand chords and chord inversions. If your students have spent any time doing chords and inversions, this arrangement may just fall into their hands very easily. Yes, I have doubled the timing. THEY WILL DO JUST FINE. Kids always start off playing this song very slowly, so counting like this is helpful for beginners. 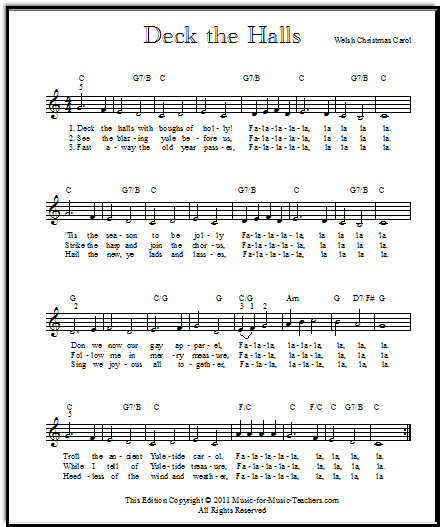 I recommend saving this song until after you and your student have spent some time working with cadences - the I, IV, and V chords - found on my free sheets on the page 12 Major Scales. That I-IV-V practice will get them ready (start with the Key of C) for the chord patterns in Deck the Halls. This arrangement really is fun to play, and pretty easy (if you have an understanding of chords). It DEFINITELY sounds better with both hands played up an octave; I tell my students it also sounds more "Christmas-y", like bells. One thing to be noted with the super-quick chord changes from C to G7, back and forth: this works well on the piano in Deck the Halls, but is NOT so effective on the guitar. The chord changes are just too fast. Play a C chord without changing, as you sing the melody, and see how it sounds. Perhaps you won't feel the need for more than one G7 chord in the first and second lines. 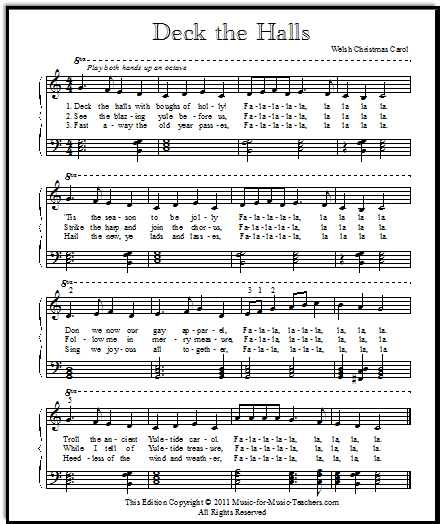 Below, I have put the Christmas song lyrics to Deck the Halls in a downloadable PDF. I hope you and your students enjoy these free Christmas songs! I just wanted to say THANK YOU!!! I started teaching my kids music and am now teaching others. This is exactly what I was looking for!! Thank you!! A thousand thanks for your beginning piano and guitar songs. 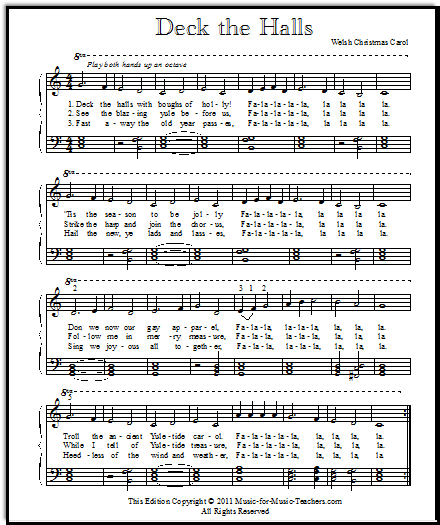 I've already printed several for my children, including the Pretty Little Horses TAB and Carol of the Bells for piano. What a wonderful resource! Do you have a funny story about this music, or does it remind you of something you'd like to share with other readers? Do you have a question? I'd love to hear it! Note that your page will not go "live" until I have approved it.